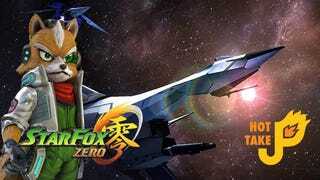 Star Fox Zero is another one of those difficult-to-critique Nintendo games. With the help of Platinum Games, much of it was done really well. It has the Nintendo polish that we expect from them. But it was yet another attempt by Nintendo to reinvent an IP by doing things differently. It got a lot right, but got a few key things... not so right. And despite fans clamoring for a return for the franchise, it saw some pretty tepid sales and reviews. Did it deserve that response from the gaming community response? Maybe. Depends on who you ask. Visually the game is fantastic. For Wii U games it is top teir. Relative to games on other consoles it is pretty good. Gamers will notice that some of the ground textures are meh, but that’s the worst I can say for the graphics. Mechanically the game works great. But the controls really hamper the experience. Using the second screen and gyro controls is unruly more often than they were useful. The intent, to use both screens simultaneously, was ill-conceived (Thanks Miyamoto). I found myself using the (-) button often to switch what was on my television in an attempt to work around the original design intent. The addition of new ships helps change up the gameplay, but eventually is forgotten. I liked piloting the gyrowing most, and the Direct-i was fun. Walker mode, in contrast, was a headache. The game has a decent difficulty curve, but those trying to get all the medals will have a tough time. Sometimes the prerequisites for finding them are a bit unclear or obtuse. I haven’t beaten the final boss yet. I blame the controls. Reusing the original Star Fox story is a double-edge sword. Though I knew that the story wasn’t new, I never experienced the original game, on either Nintendo 64 or it’s 3DS re-release (If anyone knows a place to find it used for reasonable, let me know!). That was great for me, not needing to play catch-up story wise. I appreciate that it’s sort of a soft-reset for the franchise. Nintendo can now choose new directions to go with it (with or without Krystal). The downside is that it’s a bit of a disservice to gamers who have followed the franchise, saying “all that story and lore you’ve invested in, well it’s not important now”. I appreciated that they included some amiibo functionality, but like with any Nintendo title, I wanted more. It’d been cool for to have some reskins for Fox’s ship. Even cooler would have been a nod to the theory that the Metroid, Kirby, or Zelda universe are the same as the Star Fox universe with use of those Amiibo. Maybe it’s asking much, but I giving us only two amiibo to work with was a bit disappointing. When Nintendo showed off Project Guard all those years ago as a tech demo at E3, we were intrigued, but it seemed like a somewhat shallow experience. A few years later, along with Star Fox Zero, we saw it reintroduced as Star Fox Guard. Starring Slippy and his Uncle Grippy, we’re left to defend a mining operation from robots trying to steal resources and halt production. It’s free with the physical copy and offered at a reasonable price on the eShop. With an easy entry point price-wise, it should be easy for gamers to engage in a really compelling title. The gameplay is complex and the mechanics are solid. But unlike Star Fox Zero, it uses the Wii U Gamepad in a way that feels meaningful. Paying attention both to the TV and the Gamepad asks for intense concentration, but beating a difficult level is very satisfying. It does it’s best to be lighthearted, with Slippy and Grippy throwing jabs and frog-themed, punny language flying whenever possible. It’s not laugh-out-loud hilarious, but it’s enough to be enjoyable. Playing alone is fine, but playing with friends is better. I found that having a partner who knew what was going on upped my enjoyement and made maneaging the robots a little easier. I say a little because when things get hectic, having people yelling about where to look can get you frazzled. The level editor and online is fine. I’d have loved for a little more functionality with the editor, but I think for the price it provided enough. The main game is what kept me coming back anyways. I really enjoyed Star Fox Guard. It was chaotic and intense, but never unfair. It’s use of the Gamepad was superb, making me wish that Nintendo took better advantage of it in smaller titles like this, instead of using it as an experiment in main titles like Star Fox Zero. If you have $15 to spare and a little time for a compelling and challenging game, give Star Fox Guard a try.